The culinary minds of America have turned to warm family kitchens and full dining rooms, and Ujwala’s Delicacies is no exception. That’s right, it’s Thanksgiving Week! As can often be the case when merging new-coming and traditional cultures, Americans of Indian descent often feel themselves torn between abandoning their traditional cuisine and adopting Western recipes outright in order to celebrate or making their usual foods and missing out on the delicious fun of the season. With me, you never have to make that choice. My Indian Thanksgiving recipes match the best of my homeland with the flavors of fall for a Thanksgiving experience that fit right into the American celebration without losing the feel or flavor of India. You don’t have to worry about baking big bird. With Cornish hen, bake just the right amount you need, no leftovers. Tandoori chicken made with all homemade ingredients. No food colors, no store-bought masalas. Thanksgiving borrows from traditional harvest festivals celebrated throughout the world, and naturally, that means that food is a big part of it. Unfortunately, as can often be the case when merging new-coming and traditional cultures, Americans of Indian descent often feel themselves torn between abandoning their traditional cuisine and adopting Western recipes outright in order to celebrate or making their usual foods and missing out on the delicious fun of the season. With me, you never have to make that choice. My Indian Thanksgiving recipes match the best of my homeland with the flavors of fall for a Thanksgiving experience that fit right into the American celebration without losing the feel or flavor of India. For example, I’ll show you how to bake a whole Tandoori chicken for an Indian twist on the traditional Thanksgiving poultry or a Paneerky rendition for a vegetarian option. It might sound cheesy, but I’m thankful you found your way to my Indian food blog, and I hope I can make your observation of our most delicious holiday better than ever. Tandoori chicken is a favorite Indian meal that has a huge following in America. The name Tandoori comes from the oven called tandoor, where the dish is traditionally prepared. 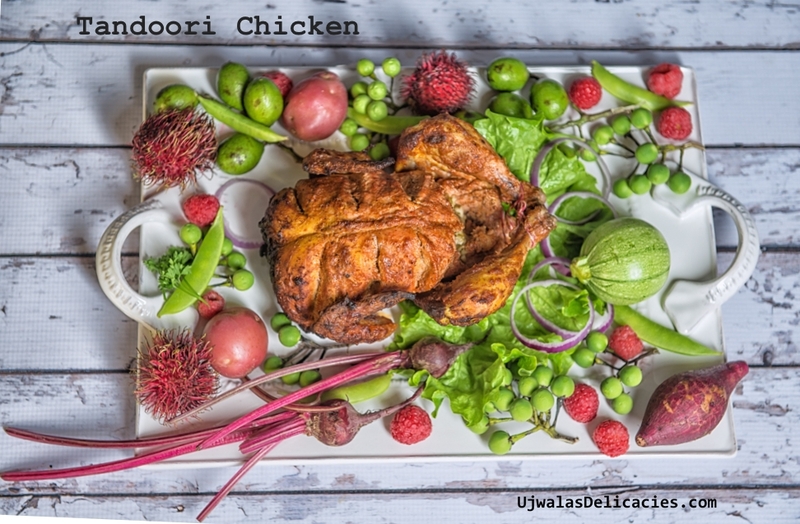 Tandoor is high heat oven, that without special marinade, the chicken will be undercooked. 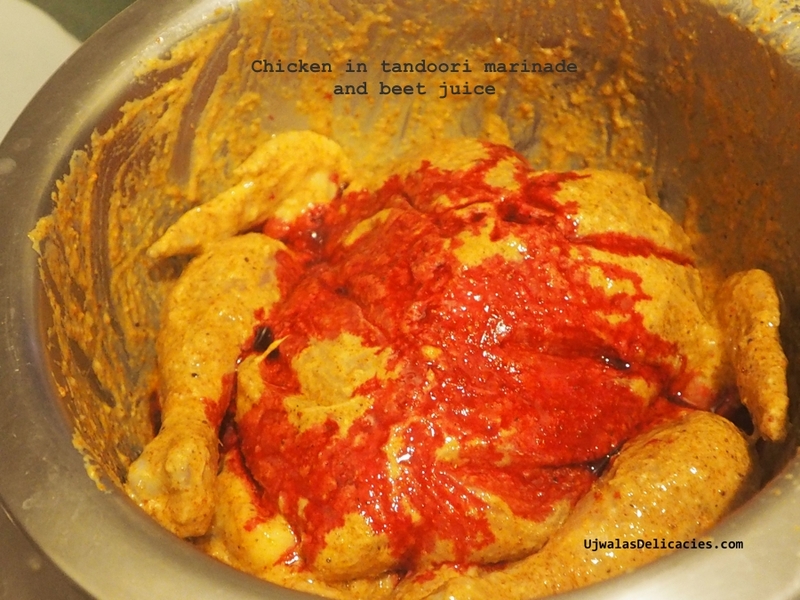 Chicken and other meats cooked with this method are identified as tandoori chicken, etc. The very high temperature at the bottom of the oven would burn the outside of any meat in about 20 minutes, leaving the inside raw. What is the technique? When meat is exposed to an acidic marinade, the bonds break between protein bundles, and the proteins unwind, forming a loose mesh. Initially, water is trapped within this protein “net” and tissue remains moist and juicy. For this reason, chicken is marinated in citrus, yogurt, and spices. This picture is taken in historic Charminar in Hyderabad, India, hotel named Sadab. 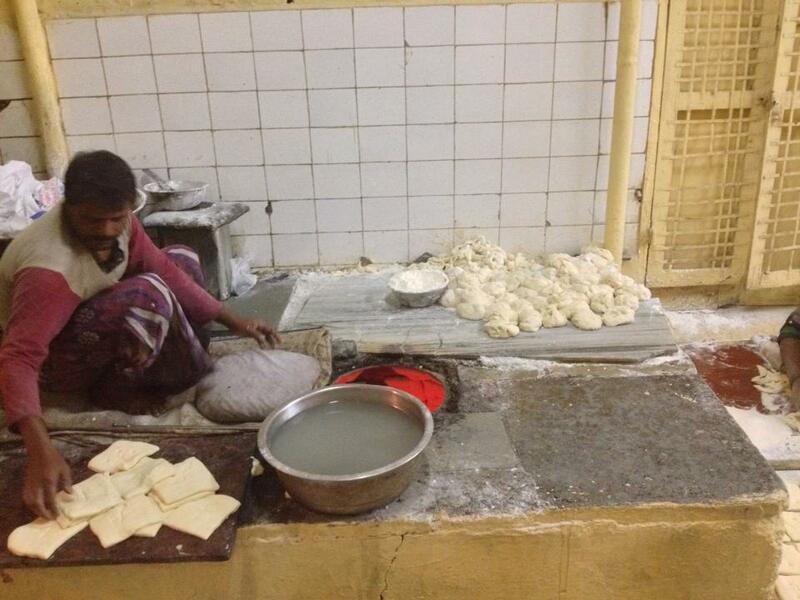 They make fresh Nihari (a type of naan bread traditional to Nizam) every night. Tandoor oven in the picture is flaming red colored one. He is sitting on top of it, slapping nihari with pillow. Used throughout India, the traditional rounded-top tandoor oven is made of brick and clay. It’s used to bake foods over direct heat produced from a smoky fire. The dough for the delicious Indian bread naan is slapped directly onto the oven’s clay using a pillow kind of stuffed bag to avoid burns. Naan is slapped to walls and left to bake until puffy and lightly browned. Meats are usually skewered and thrust into the oven’s heat, which is so intense (usually over 500 degrees F) that it cooks a chicken half in less than five minutes. Flat breads as naan, a variety of chicken dishes, kababs are made in Tandoor oven. Make 3 deep cuts on breast. Marinade and add beet juice for natural vibrant color. 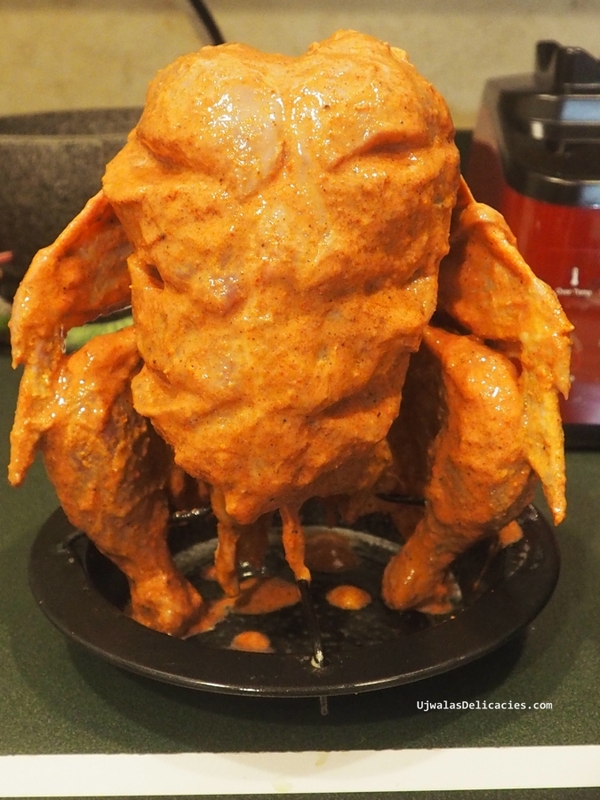 Tandoori chicken made with all homemade ingredients. No food colors, store-bought masalas. Remove skin. Make deep cuts on chicken breast. This allows marinade to sink deeper and every part of meat has marinade. Mix all marinade ingredients in a mixing bowl. Whisk well. I don't use artificial food colors. I use natural colors where ever possible. Just by using good quality chill powder and fresh ground coriander, tandoori chicken gets its orangish color. For more vibrant color, grind one beet, place in fine cheesecloth and squeeze the juice. Rub on chicken inside and out thoroughly including deep cuts. Marinade for at least for 1 hour. You can marinade before night and refrigerate. For stuffing, cook brown rice. Keep aside. In a pot, add ghee. Heat on medium. Add all vegetables and thyme. Cook for 5 mins. Add salt, stir. Cook another 5 mins till vegetables are soft. Add brown rice and cilantro. Stir and cook for 2 minutes. Turn off the stove. I bake chicken on a vertical grilling rack. This allows the heat of the oven to flow inside the bird, which means it cooks from both the inside and outside. When baking on a rack, stuff chicken after baking. 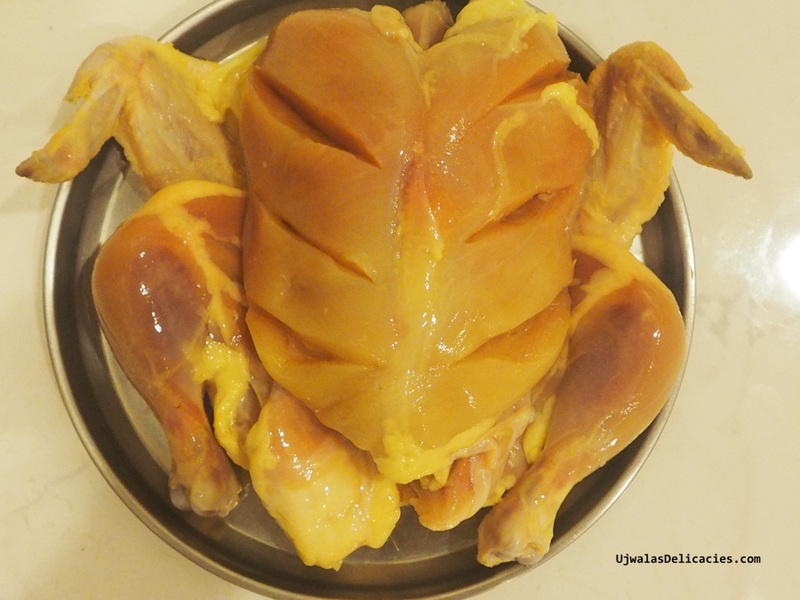 If baking of a tray, stuff chicken, place breast side up. Any excess marinade, rub on chicken. Place on the lower rack. Bake at 350ºf for 45 minutes. After 45 minutes, place oven on broil at 500ºf. Continue baking for 7-10 minutes. Keep watching after 5 minutes. Don't let chicken burn. Turn off the oven. Stuff the chicken if you haven't.